Building upon ExoGlow-NTA, a proprietary dye that enables fluorescent NTA analysis of only the extracellular vesicles present in a heterogenous sample, SBI has developed a new version compatible with Particle Metrix’s ZetaView® instrument. The new ExoGlow-NTA Fluorescent Labeling Kit (for Particle Metrix ZetaView) provides accurate EV NTA data that excludes protein aggregates, membrane fractions, and other background particles to provide EV-specific particle size and concentration. The new ExoGlow-NTA Fluorescent Labeling Kit (for Particle Metrix ZetaView) takes advantage of the fluorescence capabilities of the ZetaView NTA instrument with a proprietary fluorescent dye, which works by reacting specifically and efficiently to the surface of intact vesicles. Membrane fragments, protein aggregates, and other background particles do not activate the ExoGlow-NTA dye, resulting in exclusion of these species from fluorescent NTA analysis (Figure 1). Thus, with the ExoGlow-NTA Kit, the data delivered by ZetaView more accurately represents the EV populations in your sample rather than all particles, as is typically reported by conventional (non-fluorescent) NTA. Figure 1. The ExoGlow-NTA dye only binds to membranes of intact EVs. Unlike conventional NTA, which collects data on all particles in a solution based on light scattering, the fluorescence mode of the NTA instrument selectively detects the labeled EVs and only the data from fluorescently-labeled particles is reported. The ExoGlow-NTA Fluorescent Labeling Kit comes with three components: 1) Labeling dye 2) Standard and 3) Reaction Buffer. Simply mix the dye with the reaction buffer, add 1-100 µg of EVs (or protein equivalent), incubate for 5 minutes, and you are ready for fluorescent NTA analysis. The provided Internal Standards are size-controlled synthetic liposomes that provide a positive control for NTA calibration as well as EV/exosome labeling efficiency using the ExoGlow-NTA Kit. Don’t have access to an NTA instrument? SBI also offers fluorescent NTA as a service. Simply send us your samples, and we will isolate, label, and perform fluorescent NTA on your EVs. Email our Services department to request a quote now. SBI’s ExoGlow-NTA Fluorescent Labeling Kit delivers highly accurate EV quantitation in a quick and easy workflow. The proprietary dye offers highly efficient labeling (Figure 2), very low background (Figure 3), and is compatible with a wide range of EV isolation techniques (Figure 4). Figure 2. ExoGlow-NTA-labeled liposomes deliver consistent NTA data whether in light scattering or fluorescent mode. 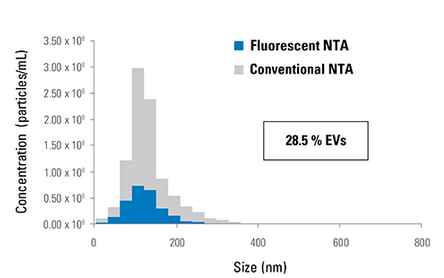 The high concordance of NTA and fluorescent NTA data collected from the ExoGlow-NTA Kit internal standards (ExoGlow-NTA-labeled synthetic liposomes) demonstrates the labeling efficiency of the ExoGlow-NTA Dye and accuracy of the fluorescent NTA method for characterizing EVs. Figure 3. ExoGlow-NTA delivers undetectable background signal. When analyzing the ExoGlow-NTA dye alone in PBS, conventional NTA picks up background particles in the absence of EVs, while fluorescent NTA of the ExoGlow-NTA dye alone shows bias-free undetectable autofluorescence. Figure 4. ExoGlow-NTA demonstrates that conventional NTA overestimates EV concentration in samples irrespective of EV isolation method. Representative data comparing conventional NTA and fluorescent NTA for EVs isolated using (A) ExoQuick, (B) ultracentrifugation and wash, or (C) column-based isolation, shows just how much of the conventional NTA signal is due to non-EV particles.